Ato delivered an amazing performance. The guy's a freakin' rock star (indeed, he plays a rapper in this episode). But of course, the kinds of people that we are, we focus on the 40 or so frames in the whole show which look like this. The Internet doesn't work so well this morning. Kinda intermittent. Tonight presumably I'm recording "Sidd". We'll see how it goes. Further inroads made with Bloodmask's edit and visual effects. So, for the last month I haven't posted. But the reason I originally started this blog was to keep my thoughts regarding the sound design of this show. Now the show is up. It opened. It got the worst imaginable reviews. And now it's closing. The show is very good. I've been with it since Andrew and Doug brought it to Manhattan Theatre Source 5 years ago, making recordings, listening, enjoying it. Tony's been the production sound mixer on the gig. But as of next Sunday, we're outta the Dodgers Stages. It's too bad. 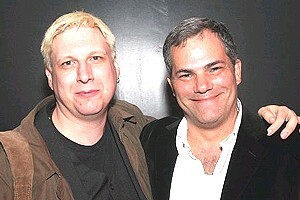 Here I am with Michael Bevins (compliments of broadway.com), the costume designer of Bloodmask, er, I mean Sidd. Yeah, he did the costumes for Sidd, too. This was the best design team -- Chris Dallos, Maruti Evans (even if he didn't build me a spaceship) and Michael. Can't say much good about the stage manager (in fact I'm on record with the AEA for having described her stupidity to her graphically) but the design team was super-fabulous. Man, I don't look good in this picture. At least Clair took that one good picture of me on the last day of principal (see below). In the meantime I have most of a "garbage" edit of Bloodmask.